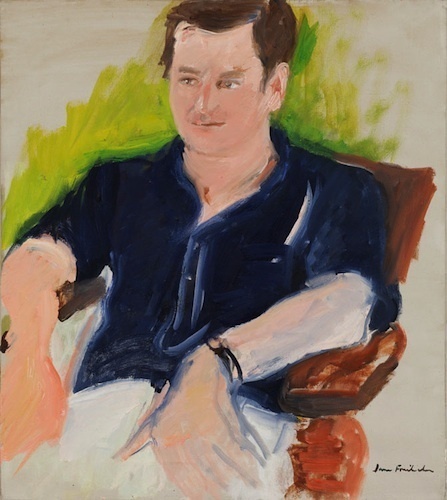 Jane Freilicher, Portrait of John Ashbery, 1968, oil on canvas, 20 1/4 x 18". The poet John Ashbery wrote, “[traditional art] can offer no very real assurances to its acolytes and since traditions are always going out of fashion it is more dangerous and therefore more worthwhile than experimental art.” It may be this sentiment that brought the poet and painter Jane Freilicher together as friends, though “Jane Freilicher: Painter Among Poets” suggests there was more than formal appreciation to their relationship. The exhibition consists of several landscapes and still lifes as well as a couple abstract paintings by New York–based Freilicher, whose career has extended over the past sixty years, along with two videos by Rudy Burckhardt starring the painter, and four vitrines featuring missives and illustrations created as well as traded among Freilicher, Ashbery, Frank O’Hara, Joe Hazan, Kenneth Koch, James Schuyler, Joe Brainard, and more. This show departs from the curatorial thematic of the artist’s circle in that the collaborative product of poet and painter is not the focus of the show, rather it is the relationship between the two that is on exhibition. In the vitrines, letters between O’Hara, Ashbery, and Freilicher exhibit the influence each artist had on the other through diaristic and informal written exchanges, while Freilicher’s portraits of both poets and of her own studio lend the texts immediacy and intimacy. Early descriptions of exhibitions at Tibor de Nagy and gossip about the circle of artists who showed there abound in the Parnassian and epistolary back and forth. In the work Parts of a World, 1987, Freilicher depicts a table with a blue china bowl, a blushing orchid, and a gray plate holding four luminous sardines, with a crepuscular cityscape glowing in the background. A gossamer sheet draped over the table radiates against a soft blue that Freilicher uses to flatten the space between foreground and background—a technique she is fond of—drawing the viewer into a poetic and emotional relationship with the space and objects. The resulting effect of the vitrines and paintings is not only documentation of Freilicher and her prominent position within the New York School poets, but also an important record of the history of Tibor de Nagy Gallery and the second-generation Abstract Expressionist movement.